While other car manufacturers are still bringing out their 2018 models, Ram is very much looking to the future. The 2019 Ram 1500 is here almost a whole year early! That’s not to say that the Ram team has rushed things, though. In fact, it’s quite the opposite. The 2019 Ram comes loaded with all sorts of cool features, some big and some small, that help it feel like a state-of-the-art vehicle. Here are our favorite innovative features of the 2019 Ram 1500. Most people in the pickup market are likely looking for a vehicle that can put up with anything they throw at it. Well, that’s certainly true with the 2019 Ram 1500. Over 98 percent of the frame is made from high-strength steel to make it that much tougher. It’s not just the frame that’s been reinforced, either, as the cab and box are equally powerful. Some don’t equate pickups with speed. However, since they need powerful engines to provide maximum towing power, a lot of them can be fast when you put your foot down. To make the 2019 Ram 1500 even zippier, the Ram team have designed it to be as aerodynamic as possible. On top of the specially sculpted exterior, there are also a few features that boost its performance, such as an active air dam, which automatically deploys when you reach high speeds. With a pickup, many buyers look for pulling power, and the 2019 Ram 1500 does not disappoint. Thanks to its 5.7-liter HEMI V8 engine, it can tow a maximum payload of 2,300 pounds with a towing capacity of 12,750 pounds. It is one of the mightiest pickups on the market today. The new Ram also offers 395 horsepower and 410 pound-feet of torque, so it can shorten any task you throw at it. The engineers behind the 2019 Ram 1500 have brought attention to detail to the next level. Under the center console’s lid, for example, you’ll find a conversion chart and protractor. While most drivers probably won’t ever put these to use, it’s still a nice touch that can potentially help those using this pickup for work. For instance, you have a handy guide to converting imperial and metric units, as well as trigonometric formulae, which is a big help if you are measuring fence lines. Of course, the fact that the 2019 Ram 1500 comes loaded with technology makes this feature a little redundant, unless you’re far from civilization — and a cell signal — but it still shows the attention to detail that the Ram team has put into it. Other exceptional features include a 4G Wi-Fi hotspot, an impressive 12-inch touchscreen, and an optional wireless charging pod. Welcome to the future of the pickup! 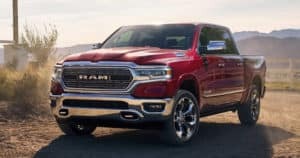 The 2019 Ram 1500 is a great choice if you are shopping for a new pickup, so make sure you consider this powerful beast when it becomes available on the market.